This is an index of all the articles for the Pomegranate Corners wool embroidery project. The index will be located under the first section of “Tips & Techniques” which can be accessed through the top menu on the website and where you’ll find a collection of other step-by-step embroidery projects featured on Needle ‘n Thread. The Leaves – Stitched and then Removed! I’ll be adding more to the list as this project develops! Incidentally, it didn’t progress too far this past weekend. 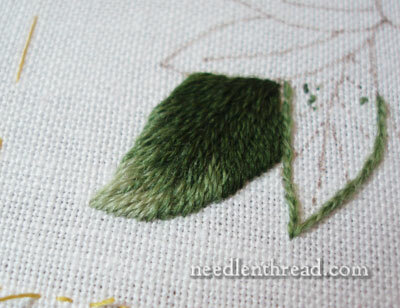 While I had high hopes of getting some stitching done, I only managed one leaf and an outline on Saturday afternoon. I was feeling the onslaught of the latest Cold-or-Flu-or-What-Have-You bug going around, to which I dutifully succumbed. Sunday was a wash. Today we’re having a snow (ice) day in my part of Kansas and the schools are closed, so I didn’t have to call in sick. But it’s doubtful that I’ll do much stitching! Hope you had a great weekend – and I will see you tomorrow, hopefully in better form! Hope you feel better! I followed your wonderful 15 minute advice and made progress on one of my projects this weekend. I was surprised how far I progressed in just 15 minutes. Looking forward to seeing your progress on the pomegranate. Hope you feel better very soon. Take care! Stay warm, stay in the bed, and hope you feel better soon, Mary. Thanks all! I’m feeling pretty well – just kind of Stuffy! Truely hope you’re feeling much better soon. Don’t know if you can get it in the States or the equivelant, but we use Vicks Vapour rub here in Oz. Great stuff. Especially for steam inhalations. I have a personal rule that goes “never do any needlework or knitting if you don’t feel well.” I don’t know how it is for other people but for me it always involves ripping and I’m sorry I did it. It is the comforting thing in the world and you want to do it! Hope the bug passes soon and you get to feeling better. Get Well Soon Mary – I’m sure you have a lovely embroidered hotwater bottle cover somewhere; put it to good use and stay warm!! So sorry you’re feeling under the weather – hope the day off and lots of hot tea will make you feel better. Hope everything is well you you all over in the States. I appear to be having a small problem with my internet access to your emails. Namely, I’m not getting them at the moment. Thankfully I have your home page in my favourites and accessed through that. Would you be so kind as to see if there is anything your end and let me know. I had this with another site and discovered I’d been deleted courtesy of a young friend. No matter how I feel in the morning at my computer, I am cheered by your breezy talk and show and tell of your project in progress. So glad I am meeting you this way. Thank you. by the way, how long you usually spend to finish embroidery, let say a flower.. because i took quite a long hour to finish it.. is it my technique was wrong? Hi Mary, How’d this turn out? I can’t find the finished thing. I am thinking that I will try this. I have a piece of the Legacy Round Linen that is about 16 x 16 before shrinking it. Would that fabric work for this? Hi, Katherine – I did not finish it. I got interrupted with a project with a deadline and just never got back to it. Funny, I was just looking at it today! I prefer a little higher count fabric for crewel work, especially when it comes to getting nice smooth edges on satin stitch and the like. But it wouldn’t hurt to test a little sample with the round yarn linen and some of your wool to see how you like it. I love your site so much; it’s a daily inspiration. Do you think that you will ever return to this piece? I love to look at your work with silk and gold, but something like this is much more likely to find its way onto my hoop. (I’m on the waiting list for a Necessaire stand & Millennium frame :-)). I would love to see how you are going to use seed stitches for the “seeds”. Thanks again for all your beautiful work.